Materials and Fields - In perhaps what might be the broadest definition, metamaterials are structures that allow us to engineer the interaction of fields with matter. For those neither well-acquainted with fields nor metamaterials, an analogy may help to introduce the concepts. Imagine standing in a meadow filled with tall grass on a breezy day. As the wind blows, the tall grass sways back and forth, responding to the strength and direction of the wind. A physicist or mathematician might describe the wind as a pressure or velocity field—a continuous quantity that exists everywhere throughout space. The wind is invisible to our eyes-a very dilute gas of molecules—but one can sense its presence as it pushes against them or other objects, moving them around. Likewise, each blade of grass in the meadow feels a force caused by the wind, and moves accordingly. As we watch the collection of tall grass swaying, driven by the wind, we are witnessing a field-matter interaction; the meadow can be thought of as a material; the wind, a field. The picture of grass swaying in a breeze can help us visualize other field-matter interactions, such as a beam of light passing through a shard of glass. Light is an electromagnetic field, consisting of electric and magnetic fields that travel throughout space and can be likened to the breeze blowing across the grassy meadow. Electrons within the glass—or any other material—are analogous to the grass, driven into motion by influence of the electric and magnetic fields rather than the pressure from the wind. Were we able to see electrons, we’d see them oscillating and jiggling, their motion driven by the fields swirling around them. Once we understand the field-matter interaction, we can do useful things with it. For example, a windmill extracts energy from the wind by converting it to mechanical motion and eventually to other forms of energy that can be stored and later accessed as needed. Many other types of fields can also be controlled or harnessed by engineering their interaction with materials. Materials are the means by which we can take hold of and manipulate what is otherwise invisible. Metamaterials take things a step further, allowing us to create the exact kind of material response we want for some particular application, rather than relying randomly on the properties of conventional materials and compounds. Just as we fashion windmills to produce power from wind rather than trying to use grass, we can structure metamaterials to control fields in ways just not possible with conventional materials. It is difficult to arrive at a strict and unambiguous definition of a metamaterial that wouldn’t exclude many types of structures that rightfully should be considered part of the metamaterials universe. For this reason, the definition above is purposefully somewhat vague. What is important, though, is that a metamaterial is not a tangible thing; rather, a metamaterial results from a design approach that satisfies the spirit of the above definition. The metamaterial concept has influenced the way we think about materials and device design, and in many cases has allowed us to identify solutions to problems in efficient and novel ways. Origins - The expansive metamaterial concept was developed in 1999 by Rodger Walser, then at the University of Texas in Austin, who suggested that carefully constructed composite materials could achieve physical properties well beyond their constituent components. The idea was not without precedent: Fiber composites—mixtures of carbon or glass fiber and polymers—had existed for decades prior, and were widely used for creating strong yet lightweight structures. Still, Walser and many others believed there was much more to the concept that had not been fully exploited, especially in areas outside of structural engineering. Indeed, as the metamaterials community grew and started avidly exploring the concept, a wealth of new physical paradigms and engineering approaches were quickly discovered. So profound were these discoveries that some of our most basic physical concepts were challenged. In fact, the advent of metamaterials prompted a re-examination of underlying concepts in the field of optics as well as in many other fields. To this day, the metamaterials concept continues to inspire and influence thought across many disciplines of science and engineering. Metamaterials in Our Group - Our group at Duke has been involved in metamaterials research since 1999, about the time when the first concepts began to emerge and the field was in its infancy. Since that time, we have investigated some of the most fundamental electromagnetic phenomena unlocked by the unique material properties of metamaterials, including negative index and transformation optics. We have also developed a suite of theoretical and numerical tools for designing and characterizing metamaterial structures, enabling us to quickly produce structures as needed. In a more recent trend, we have begun coupling metamaterials with other technology areas in an effort to connect metamaterials with real-world applications. This has led to a number of commercialization efforts and spinoff companies developed with one of our key collaborative partners, Intellectual Ventures. Negative Index Metamaterials The prospect of creating a sort of material that had never existed before is what helped fuel the enormous interest in metamaterials. Negative index materials were predicted to exist in 1968 by Russian physicist Victor Veselago, but had never been demonstrated using any conventional materials. All that changed in 2000, with the demonstration of the first artificially structured negative index material, sometimes called a Veselago material. Our group (then at UCSD) demonstrated the first negative index metamaterial in 2000, following up with a demonstration of negative refraction-proving one of Veselago's conjectures. Both these experiments, as well as the entire notion of negative refraction, attracted intense controversy for a couple of years (as well as all of the interest). To this day, negative refraction challenges some of our most deeply held intuition about the way light should propagate in a material. Metamaterial Rules and Tools Our group has spent a great deal of time pondering how to design metamaterials. Throughout the years, we have devised a set of tools by which we can create metamaterial designs rapidly and efficiently, enabling us to probe the fascinating new wave optics that metamaterials offer. One approach, depicted here, is to simply observe the way that a wave behaves when it bounces off a metamaterial, and work backwards to determine what the effective properties must be. While not the most rigorous approach, this retrieval method can be applied quickly both in simulations and measurements, and with minimal resources. By leveraging retrieval techniques such as these, we are able to create quite complex and intricate metamaterial structures with unprecedented properties. A very basic introduction about how homogenization works can be found here . Circuit Metamaterials Why do our metamaterials look the way they do? While there are many paths to forming artificial materials, in our group we have favored metamaterials based on conducting elements. These elements resemble little circuits, and in fact can be analyzed and understood easily using basic circuit theory. Circuit metamaterials provide a useful link between electrical engineering and material physics, which our group has exploited in the designs of metamaterial structures. Especially at microwave frequencies, where there are so many potential metamaterial applications, conductors allow us to design virtually any material response we desire. Learn more about how all of this is possible here . Transformation Optics and Cloaking One of the most compelling concepts to emerge from the metamaterials field is electromagnetic design by coordinate transformation, or transformation optics. In the transformation optics approach, one first manipulates rays of light by pretending to warp the empty space through which they travel. While it really isn't possible to warp space in such a manner, it is possible to create a material that will have the identical effect of that imaginary transformation. The difficulty is that the material required is extremely complex, and not easily created using conventional materials. 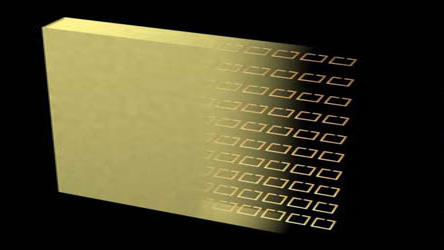 Artificially structured metamaterials, however, are a perfect match for transformation optical designs, and we have used the metamaterial approach to design a structure that acts like an invisibility cloak at microwave frequencies. Learn more about transformation optics and cloaking here . Nonlinear Metamaterials Light can sometimes be boring, since it just follows a straight line from one point to another, and doesn't interact with itself. However, light does interact with matter, and that's when things get more interesting. Materials can be used to reflect, transmit, focus, absorb and generate light-all important functions in the overall control of light. To gain even more control, the inherent nonlinearity in materials can be leveraged to create much more functionality, including wavelength shifters, frequency doublers, switches, modulators, and many other devices important to a host of technologies. And, as interesting as linear metamaterials have proven to be, nonlinear metamaterials offer even more surprises and opportunities, since now both the linear as well as nonlinear responses can be designed at will. The possibilities are nearly endless!